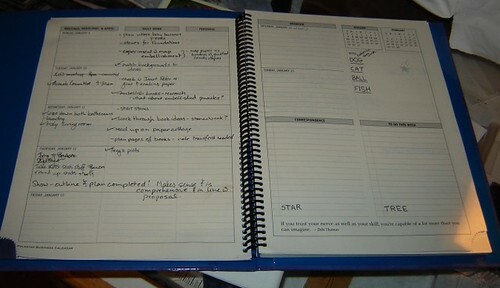 A couple of years ago, Mom received two dayplanners for Christmas. Not wanting to return them, she kept one and passed the other along to me. It was a Polestar Business Calendar, but a business calendar with real panache (Canadian, too!). I’m not one for dayplanners that have your entire life mapped out for you by the half hour. My life, unlike my husband’s, doesn’t divide neatly into billable half- or quarter-hour slots. I like lots of space to write things in, extra space for stuff that doesn’t fit into normal categories, and the ability to see the entire week at a glance. I’ve taken to adapting their columns to various purposes. One is relegated to tasks for a given day, another has become “stuff to accomplish during the week” and the final one often becomes a grocery and errand list. However you choose to use them, they’re great! The inspirational quotes on each page are also niffy. For the past few years now, I’ve been using these planners. 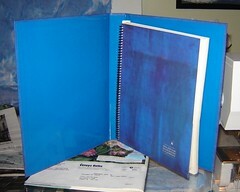 Last year, they made their business calendar hardcover, which had its advantages, but did make it slightly bulkier. When they went back to softcover this year, they offered a free hardcover sleeve. Turns out the hard cover suits me better, so I called about the sleeve last week. It arrived yesterday and definitely makes the planner a bit larger and thus easier to find in the piles of stuff in my sewing room. Some photos of the calendar in use…..